The rain could not keep us away as we celebrated a night of affirmation of friendship, triumph beyond circumstances and a celebration of dance. We gathered at the Elizabeth Sneddon Theatre on Tuesday, November 20, 2018 for the Flatfoot Dance Company’s 2nd annual integrated programme in conjunction with the Flatfoot Downie Dance Company for a dance work Ngila (I am here). The night was one for the books as we gathered in celebration of the power of dance and the African concept of Ubuntu for I am, because you are. The night’s curtain-raiser was by Flatfoot Junior Company which offered the performance of Sesila/We are here! performed and choreographed by the Flatfoot Dance Company’s Sbonga Ndlovu, Ndumiso Dube, Siseko Duba, Qhawe Ndimande and Mthoko Mkhwanazi. The group created a work that explores issues of community and solidarity amongst five young black South African men portrayed through strong, yet delicate, unified movements and a brotherhood that could be felt beyond the stage. The stage lit in faint white lights and misty creating an ambience which I translated to be the concept of “no man is an island” - living in this world we all in need of companionship, support, love, and community. We are stronger as collective. The night followed with Ngila/I am here, choreographed by Lliane Loots in collaboration with the dancers. Four Flatfoot dancers Sifiso Khumalo, Qhawe Ndimande, Jabu Siphika and Zinhle Nzama partnered up with their counterparts, Karl Hebbelman, Charles Phillips, Kevin Govender and Michaela Munro. The programme’s choreography is best described as a dance explosion that is an affirmation of faith, courage and the joy of dance. The curtain rises and the dancers are standing stage left huddled as the spotlight slowly rises upon them. Four-legged wooden stools set on each side of the stage running from upstage to down, the dancers dressed in blue shirts, grey pants and white vest slowly raise their heads looking to the ceiling followed by their right hands slowly rising, reaching up then dropped. We sit engaged to what flourishes to be the most beautiful, charismatic and playful dance. A light-hearted story of friendship and love, a play of hide and seek. The dancers’ passion and energy was carried throughout the dance and stage. I was inspired by the tickles and giggles, the spontaneous Michael Jackson moves and vibrant music which was both mischievous and playful enhancing the mood, the dance work and strong friendship being forged on stage. It was a truly inspiring and endearing performance to watch. 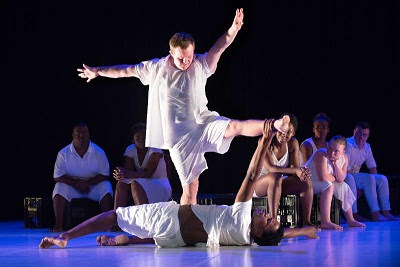 The performance was offered as a fundraiser by the Flatfoot Dance Company to help culminate the year-long integrated dance programme working with dancers with Down syndrome fondly referred to as the Flatfoot Downie Dance Company.